Cooking for a New Year’s Eve dinner party is stressful enough, but producing it on board, in 30 minutes, to a preference sheet of strict dietary requirements highlights the stress charter superyacht chefs face. 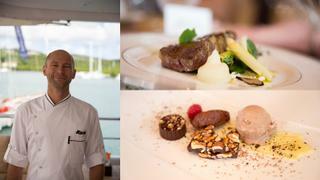 Twenty-seven chefs, across three categories, were bold enough to take on the challenge at this year’s Culinary Contest at the Antigua Charter Yacht Show (4-9 December, 2019). Chef Micail Swindells of 77.42 metre Go was a close second and Chef David Pearson of 55.78 metre Galaxy took third place. Chef Megan Ross of 78.33 metre Amaryllis also received an honourable mention. 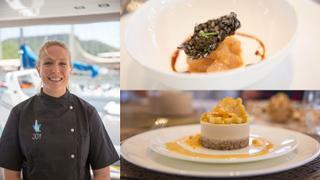 Chef Jamie Sparks of 38.4 metre Berilda finished second and the yacht also won the Tablescaping competition in this category, under chief stewardess Robyne McNeil. Chef Philip Clarke of 41.15 metre Ruya finished third. The smallest yacht category had arguably the most demanding brief with a traditional Austrian family evening requested. Chef Desree Pierce, on board the recently delivered 23.47 metre catamaran Joy, won with her creative twist on the requests. She started with a miso cured ceviche and followed with sous vide red wine Ibérico Pork Pluma. Before concluding with a vegan piña colada cheesecake. “I looked at the preference sheet and tried to read into the basics of what they wanted. They wanted flavour, they want something that they are familiar with but they are in an exotic area. So, I tried to pick out elements but give them something exciting,” said Pierce. Chef Inn Boisson of 37.19 metre Arion, who went to Vienna to research the brief, finished second. 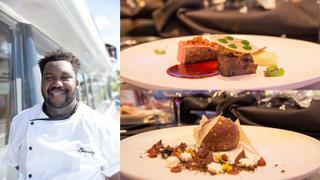 Chef Ely Reyad of 35.36 Unbridled finished third, with the yacht also winning the Tablescaping contest. The competition was sponsored by Boat International Media Group, Boat International USA, Dockwalk and Kennedy's Club. Extended coverage will be in the March Issue of Boat International and Boat International, US Edition.